It was 16th November 1960 and Burnley were to play in the European Cup for the first ever time. The championship success of the previous season meant Burnley were the country’s representatives in a competition that was still in its infancy; a competition that had been won by Real Madrid in each of its five seasons. Twice, in the finals of 1956 and 1959, they had defeated Stade de Reims and it was the French club that Burnley had been paired. This time, after those two losing finals, they were tipped to go one better and win the competition outright and become the second ever winners. It was appropriate in this particular week that we came up against European opposition given that the previous Sunday had been Remembrance Sunday. It hadn’t been a good one either. Mr W. H. Barnes was the chairman of the Burnley branch of the British Legion and had been involved since 1922. I think, over 57 years later, Mr Barnes would now be proud of the response and the standing for a minute’s silence at football as is witnessed across the country each year at football matches. The headline news in the Burnley Express that week was of the big fire that had engulfed the Empress Ballroom on the previous Sunday. It brought the life of the ballroom to an end and the owners, Mecca Ltd., moved quickly to acquire a two year lease on the Mechanics Institute to allow them to continue in business until the new premises, promised for the Pickup/Croft area were ready. The big news for Burnley’s drinkers was the confirmation that pubs in the town would remain open for an extra thirty minutes each night, apart from Sunday. The new 11:00 p.m. closing didn’t suit a lot of the landlords although the customers thought it was a great idea. 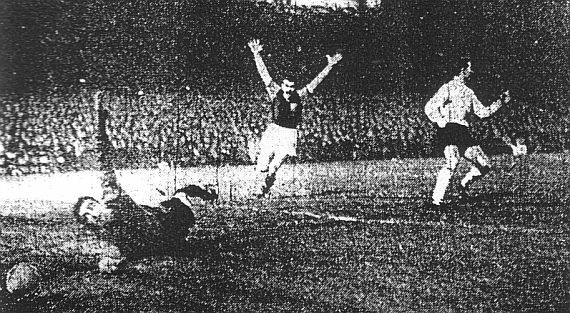 But on this day, 16th November 1960 there was only one real item of news in Burnley and that was the arrival of European Cup football. Such was the importance of the game that Burnley opted for their special cup tie training and went off to Blackpool on the Monday ahead of the game. Reims had arrived in Burnley and the official party included twelve journalists and eleven supporters. Other French partisans, it was said, had gone straight to Blackpool. Reims had injury concerns. They’d played Grenoble on the previous Friday and St. Etienne two days later. It left Raymond Kopa nursing a bruised ankle and he was doubtful [although he did play]. Juste Fontaine, another of their start players was ruled out. Burnley meanwhile had just beaten Wolves, themselves experienced European Cup campaigners from the previous two seasons, 5-3. Burnley Football Club allowed their visitors the use of Gawthorpe for training and even made their after-training baths available to the French champions. Ahead of the game, Burnley supporters were given a warning. Because of it being a big game it was thought that expert pickpocket operators from Manchester, Liverpool, Birmingham and even London could be in attendance. All spectators were advised to leave valuables at home, particularly with the game being played within the hours of darkness. So to the game and what a game it was, as reported in the Burnley Express through the words of Don Smith. “Gala night with an international atmosphere at Turf Moor, on Wednesday, resulted in both teams being given an ovation at both interval and final whistle, while those who have booked their seats for the various flights to France could view the return match with a certain amount of confidence. Reims realised they had to keep more than a watchful eye on the Irish genius McIlroy but centre-forward Pointer caused them endless problems as his non-stop dashes distracted them. The player who rose to the occasion more than most, and in more ways than one, was Blacklaw. His display must have ranked as one of his best. He tipped over a 30-yard volley from Moreau, saved a Piantoni header and kept out a wonderful curling drive from Vincent. In the very first minute, Burnley went on the attack via a long diagonal ball from Miller. Rodzic headed out but only to Connelly who hooked a pass forward for ROBSON to score. What a start, and on 22 minutes it was 2-0. A shot from MCILROY had the sting taken out of it by Siatka. Goalkeeper Jacquet, who was covering the original direction, had the mortification of seeing the ball roll into the far corner as he was still desperately trying to halt his own progress towards the other side. McIlroy hit the bar in the second half but Jacquet had more anxiety than actual action, while at the other end Blacklaw nobly indulged in both to emerge from his ordeal with real honours. And so it was 2-0 and Burnley could look forward to the second leg at the Parc de Princes two weeks later. Supporters wanting to go to the game were warned by Althams Travel that they WOULD need passports. Passengers on flights from London to Paris didn’t need them but from Manchester they were very much required. Althams offered full help to people in acquiring passports. Stade de Reims: Jacquet, Wendling, Rodzik, Leblond, Siatka, Moreau, Rustichelli, Muller, Kopa, Piantoni, Vincent. Referee: Senor D. Jose Gonzales Echevarria (Spain).